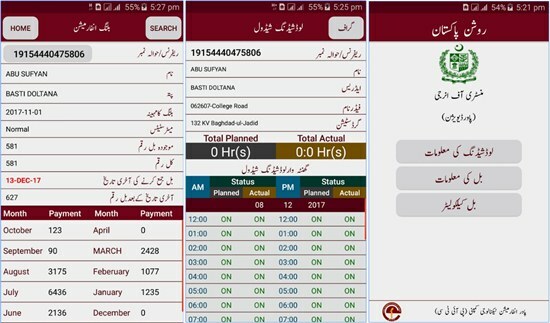 WAPDA has just launched a very useful mobile application which make electricity consumers to check Load-shedding Schedule and Billing Details. This app also allow its consumers to get estimated bill through bill estimator by just entering consumed units. You can also get duplicate bill of all electricity distribution companies on this app. Currently this application is available only on Android mobiles. There are two different versions of this app is available on Play Store; Roshan Pakistan (English Version) and Roshan Pakistan (Urdu Version). Users are able to view actual and planned load-shedding schedule of their area by entering meter reference number (which can be seen on the bill). Users are also able to view billing details and duplicate bill of their electricity meter on this mobile application. Users can also get estimated bill simply by entering consumed units.